I'm doing a talk today at the Employment Research Institute in Edinburgh, so I thought I'd put my presentation here and also post a few nuggets of information. Employment deprivation is the subject of the talk and I've been exploring spatial patterns in relation to this. What is 'employment deprivation'? It's involuntary exclusion from the labour force. A few bits of information... Out of the different indices of deprivation for England and Scotland between 2004 and 2010, the highest figure for employment deprivation was in a LSOA in Rochdale, with 75% of people out of work. The highest figure in Scotland was a Data Zone in Glasgow in 2004 and one in Edinburgh in 2006 with 65% of working age people not in work. There are no major surprises in the general spatial pattens but there are interesting findings in the spatial analysis in the presentation (well, that's what I think). Information on how to do this can be found here. It's not that difficult but it does take a while to figure out. My view is that fusion tables are a very powerful way of visualising data and making it easily accessible online. Still in its infancy really but worth a look. 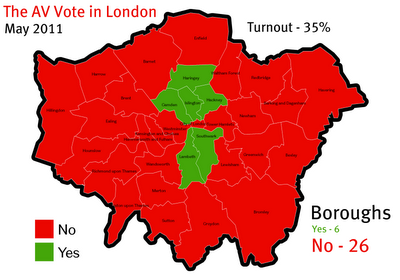 The important thing here is not the overall result (an emphatic 'No' to AV), but the manner in which the 'Yes' vote is spatially clustered. Early work on this kind of thing was pioneered by Kevin Cox in the late 1960s and later by Ron Johnston. I just thought I'd play around with the data to see what it looked like on the map. I'm doing a seminar at the Employment Research Institute in Edinburgh later this month on the topic of employment deprivation in England and Scotland. Recent posts have mostly been about England and patterns of deprivation there and I've been neglecting my native land. 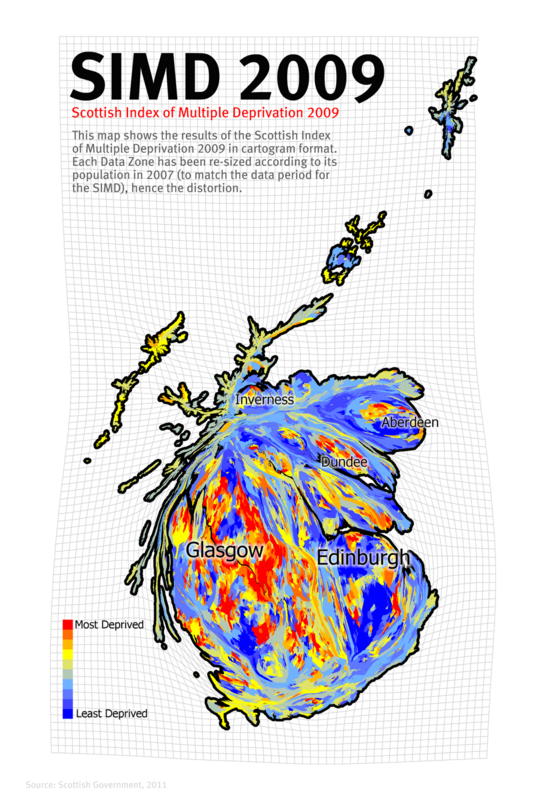 So, I thought I would use some of the data to take a look at patterns of deprivation in Scotland using a population-weighted cartogram. 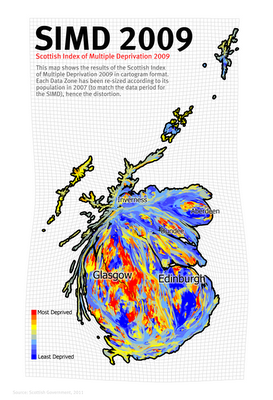 The result is below (click to view full size).